The difference a week makes was clear last weekend, as Goodwood scheduled their 77th Members’ Meeting later this year to avoid last year’s bad weather. It was held in March, 2018, and visitors to the Goodwood Motor Circuit will remember the heavy snow which fell and changed some of the schedule due to bad driving conditions, but also resulted in some interesting action on the track. This year, however, the 300,000 Goodwood Road Racing Club members, fellowship subscribers and their friends and families could enjoy the summery feel as the sun shone brightly most of the weekend and showed off some excellent racing. A new race was added this year, The Betty Richmond Trophy, named in honour of the Duke of Richmond and Gordon’s grandmother, which saw 60 Minis race around the track to celebrate the car’s 60th anniversary. Ian Curley and Nick Swift starred in the two Betty Richmond Trophy races for Minis which kicked off the on-track action at the 2019 Goodwood Members’ Meeting. Curley dominated the opener, leading from pole position to the flag, but he was never more than three seconds up on his pursuers. At the start, Curley got the drop on fellow front row starters Darren Turner and Tom Blomqvist, with second row man Bill Sollis blasting his way into contention on the run to Madgwick for the first time, only to connect with Blomqvist. The latter pulled off a heroic save but was bundled down to sixth place. Sollis was eliminated shortly thereafter following an accident at St. Mary’s. Curley was chased hard by Chris Middlehurst and Ben Hatton during the early running, the latter being lucky to survive a huge moment on the run to St Mary’s as he attempted to wrestle second place from Middlehurst. He clouted a kerb on the third tour and connected with Middlehurst. The latter was able to continue but Hatton retired his car. Lars Ekorness then closed on Curley but wasn’t able to mount a serious challenge, with 0.78sec splitting them after 20 minutes of racing. Blomqvist recovered to claim a well-deserved third place. Craig Davies and Andy Newall emerged victorious in a thrilling 45-minute Gerry Marshall Trophy encounter for Group One saloon cars on Saturday evening. It was a dramatic race, with works Porsche ace Neil Jani blasting into the lead from the outside of the front row at the start in the Rover SD1 he was sharing with James Wood, only to run out of road seconds later. Newall survived a last lap scare after the car slowed appreciably, to lead home Jani and Wood by 33sec, with the Faberge-liveried Chevrolet Camaro Z/28 of Nigel Garrett and septuagenarian star Stuart Graham in third. Former F1 star Mark Webber, Le Mans winner Richard Attwood and Top Gear presenter Chris Harris led an incredible parade of Porsche 917s to celebrate the 50th birthday of Porsche’s original Le Mans victor. In July, the Festival of Speed, presented by Mastercard, will enter its 27th year. This year, on July 4-7, six Formula 1 teams are already confirmed to attend with several of the current drivers. 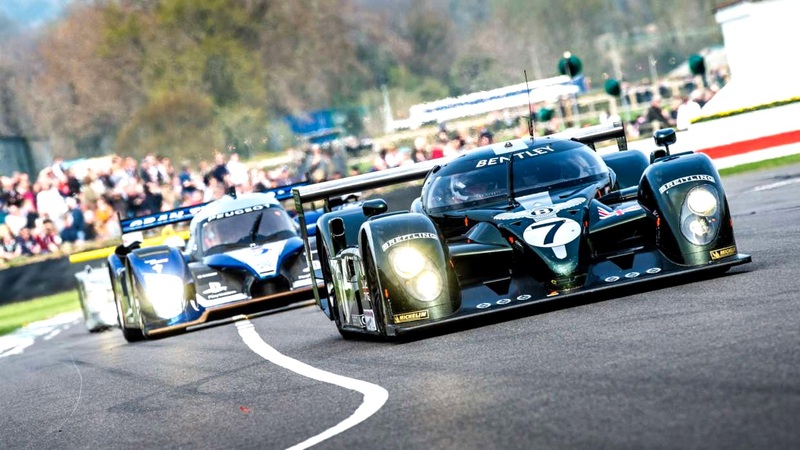 Tickets for the Festival of Speed are available from: goodwood.com and from Goodwood Customer Sales on 01243 755 055.